Click image to enlarge Chamberlain Lake as seen from Washington Highway 14, Washington. View looking east from moving car. Image taken June 15, 2013. 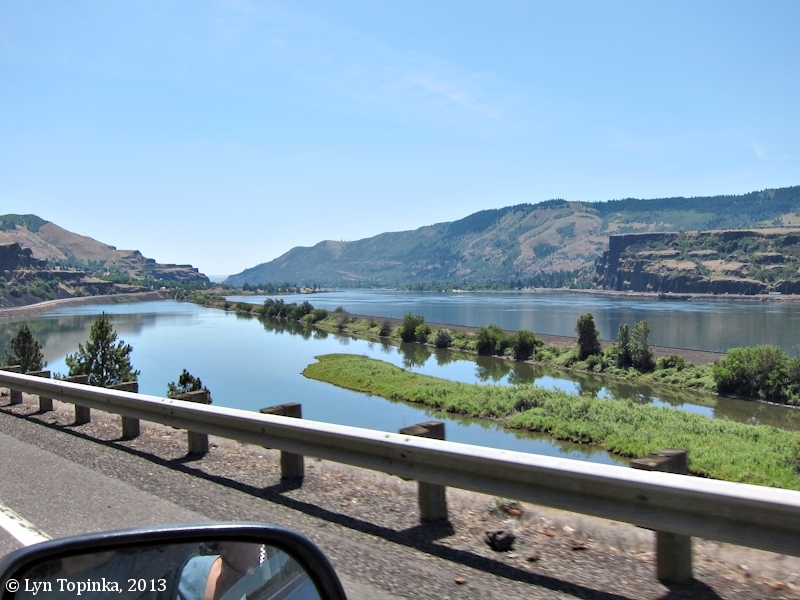 Chamberlain Lake is on the Washington side of the Columbia and stretches between River Mile (RM) 179 and RM 180. Chamberlain Lake Rest Area is downstream of the lake, as well as Hewett Lake, Major Creek, and Catherine Creek. 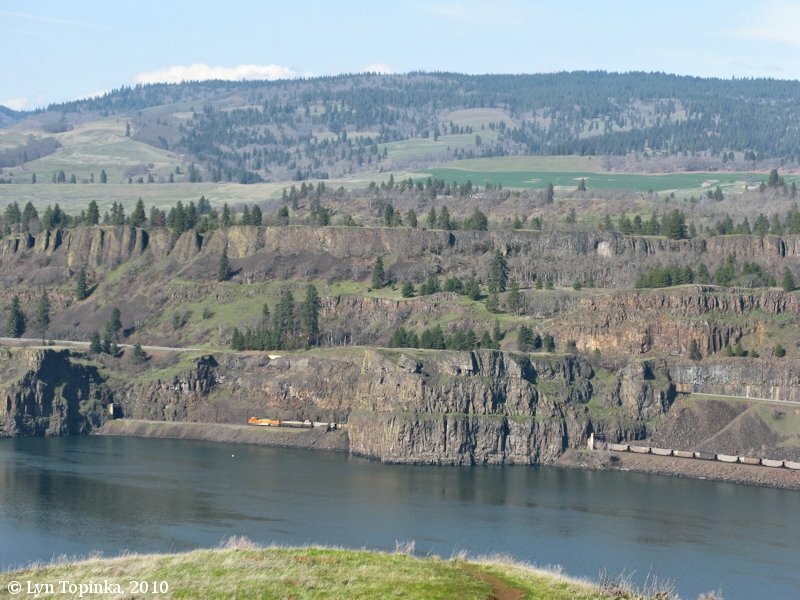 Upstream is the mouth of the Klickitat River and Lyle, Washington. The mightly basalt cliff of the Rowena Gap, once known as "Cape Horn" lies across from Chamberlain Lake. The Chamberlain Lake Rest Area is off of Washington State Highway 14 downstream of Chamberlain Lake. 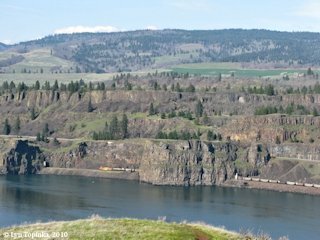 The Rest Area offers good views of Rowena Gap and Memaloose Island. Chamberlain Lake was named after R.H. Chamberlain. The U.S. Bureau of Land Management's General Land Office (GLO) Records database shows Robert H. Chamberlain being granted title to 80 acres of T3N R12E, Section 21, on April 12, 1913 (1862 Homestead Entry Original). This property lies northwest of Lyle. The 1934 klickitat County Map (Metsker Maps, courtesy "HistoricMapWorks.com") shows "R.H. Chaimberlain" property north west of Lyle plus more property on the north side of the SP&S Railway line. 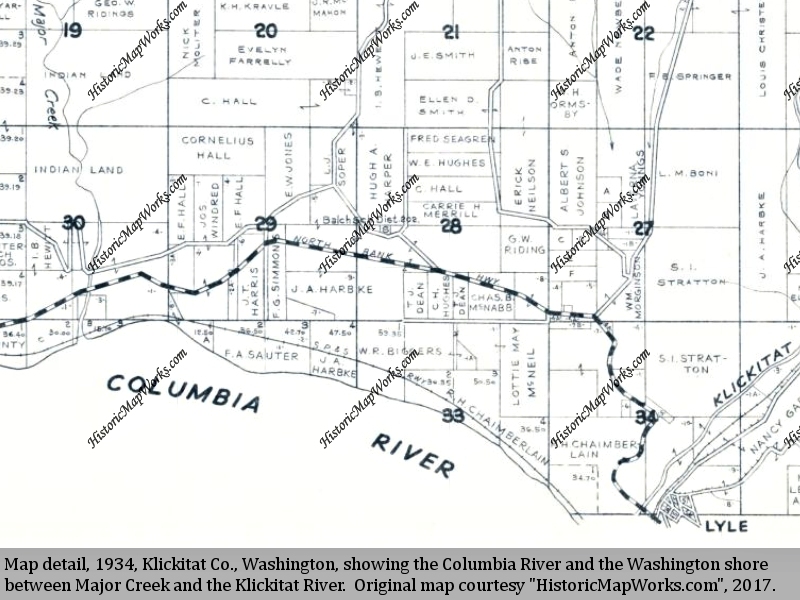 Click image to enlarge Map detail, 1934, Columbia River from Major Creek to the Klickitat River, Washington. Map shows the property of "R.H. Chaimberlain", today the location of Chamberlain Lake. Metsker Maps. Original map courtesy "HistoricMapWorks.com" website, 2017. 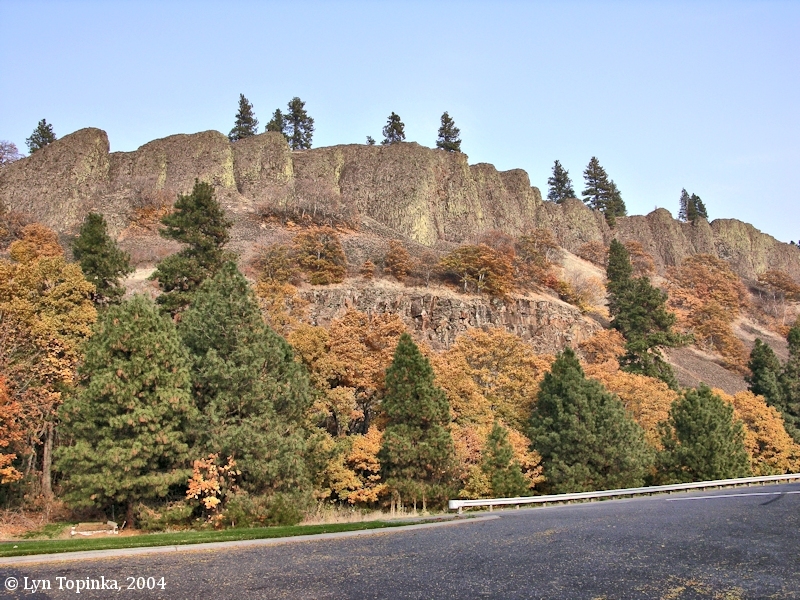 Great views of the basalt flows of the Rowena Gap can be seen from the Chamberlain Lake Rest Area, and from the hills at Chamberlain Lake. The Chamberlain Lake Railroad Tunnel, originally built as Tunnel No.9 for the Spokane, Portland & Seattle Line, (now the BNSF) lies downstream of Chamberlain Lake. 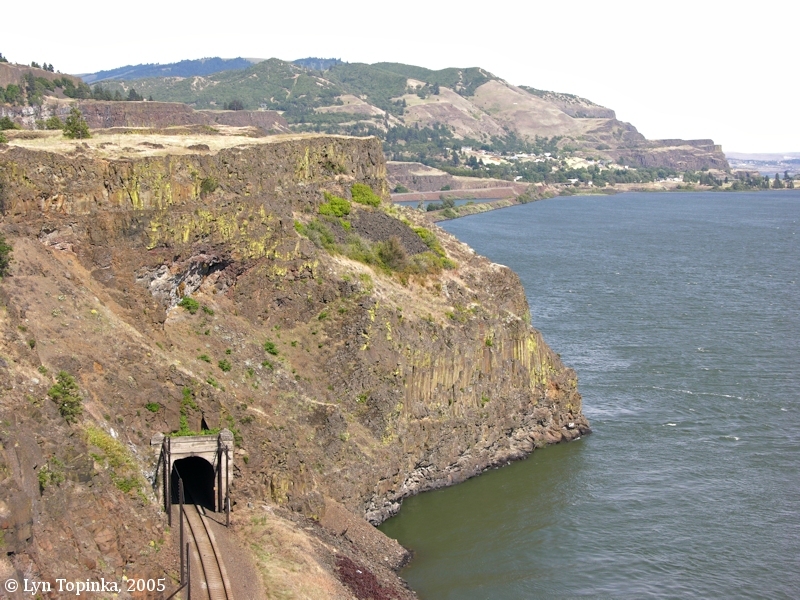 Heading east the tracks exit the tunnel and continue over a causeway separating Chamberlain Lake from the Columbia River. The west portal can be viewed from the Chamberlain Lake Rest Area. Click image to enlarge "Woldson's Tunnel", BNSF Railroad Tunnel No.9, at Chamberlain Lake. 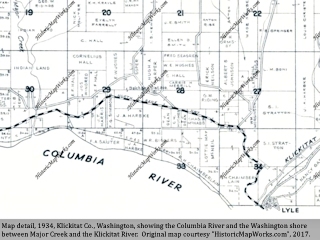 West portal of the railroad tunnel at Chamberlain Lake. View from the Chamberlain Lake Rest Area. Image taken June 4, 2005. 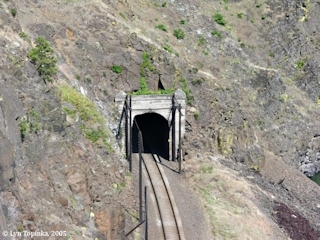 Click image to enlarge "Woldson's Tunnel", West Portal, BNSF Railroad Tunnel No.9, at Chamberlain Lake. View from the Chamberlain Lake Rest Area. Image taken June 4, 2005. Click image to enlarge Basalts near the Chamberlain Lake Rest Area. Image taken November 11, 2004. 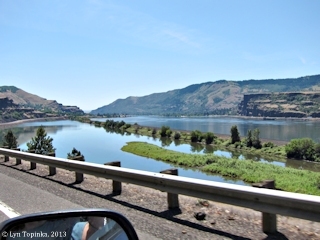 Click image to enlarge Columbia River Basalts near the Chamberlain Lake Rest Area, Washington. View from Tom McCall Nature Preserve, Oregon. Image taken March 6, 2010.